You may pre-order this title now and we will ship it to you when it is available. In War and the Rogue Presidency, Ivan Eland shows that almost immediately after the nations founding, starting with the first presidency of George Washington, the executives role in defense and foreign policy began expanding past what the framers of the Constitution had envisioned. The Constitution enshrined Congress as the dominant branch of government, giving Congress, not the President, most of the powers in defense and foreign policy. This comprehensive book shows how the presidential aggrandizement of greater powers has only been possible because of congressional abdication. However, this expansion of the executives role was still relatively contained until the Cold War when undeclared, permanent war became ongoing policy, and then the post-9/11 war on terror dramatically expanded the Presidents role. Such expansion has had deleterious effects on U.S. foreign policy abroad, as well as a major erosion of the republic, its security at home, and the liberties of American citizens. 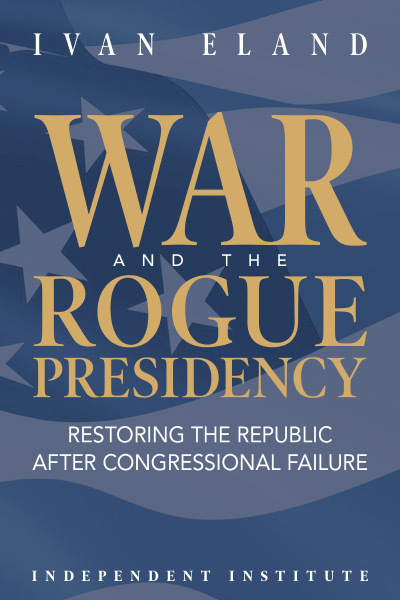 War and the Rogue Presidency is an in-depth examination of the history of the congressional-executive tug-of-war over U.S. security policy and why reclaiming constitutional standards is essential to restore both an effective national defense and civil and economic liberties. To get Congress to do that, Dr. Eland presents ways in which internal congressional incentives could be changed to provide motivation for legislative pushback. As a result, the book suggests important actions Congress could take for such a pushback along with other reforms that would effectively rein in the rogue presidency. Introduction: What Is the Imperial Presidency? Charles W. Freeman, Jr., former U.S. Ambassador to Saudi Arabia; former Assistant Secretary of Defense for International Security Affairs; Chairman, Projects International, Inc.